eRun possesses extensive experience in project implementation of global financial institutions or international chain, covering industries from food to cosmetics, leather bags, fashion, wine and health care, and from small independent caterers or retailers to large international projects. We believe that the success of any projects starts with understanding your business nature, your operation processes and your future plans. To achieve a smooth implementation, we have developed a detailed implementation manual to clearly communicate every aspect of the project with your person-in-charge. This is to ensure a thorough understanding of the specific needs of your company, and that our project management team will have detailed reviews on the processes and procedures to guarantee each installation can be delivered with consistent quality service and time. eRun is also specialized in other areas of project management such as integrations and customizations. Our application programming interface (API) facilitates easy and affordable enhancements to allow you to add custom functionality to meet the special needs of your business. To avoid surprises and have better risk control, we bring in requirement validation document and user acceptance test in the implementation processes of any customizations. We will go through every details of screen designs, planned workflows or templates with you before the custom programming starts. 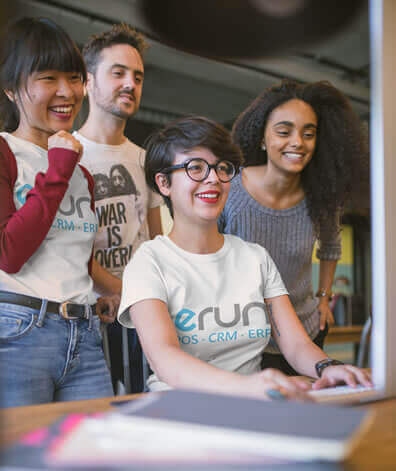 The user acceptance test will ensure eRun can deliver reliable custom functionality to realize your vision for your business. We will provide FREE training right after the installation to help your managers, staff and back office executives to get familiar with our system as quickly as possible. We also offer training sessions that are tailored to meet your special needs with a small amount of charges. Training can take place either in your premises or in the office of eRun, or you may choose to run remote training programs via Internet connection. In the meantime, eRun Support Site is coming. You can log in to the platform for detailed instructions about how to do anything on our systems.